‘Code Crimson’ is a term that has commonly been used by hospital-based teams managing patients with life-threatening haemorrhage that is refractory to resuscitation. The purpose of a ‘Code Crimson’ activation is to streamline patient access to definitive intervention, including an operating theatre or interventional radiology suite. The ITIM Clinical Review Committee has lead the development of a clinical practice guideline to enhance the current management of a patient with life-threatening traumatic haemorrhage by recommending that pre-hospital medical retrieval teams initiate a ‘Code Crimson’ activation, thereby further reducing the time to definitive intervention in these patients. 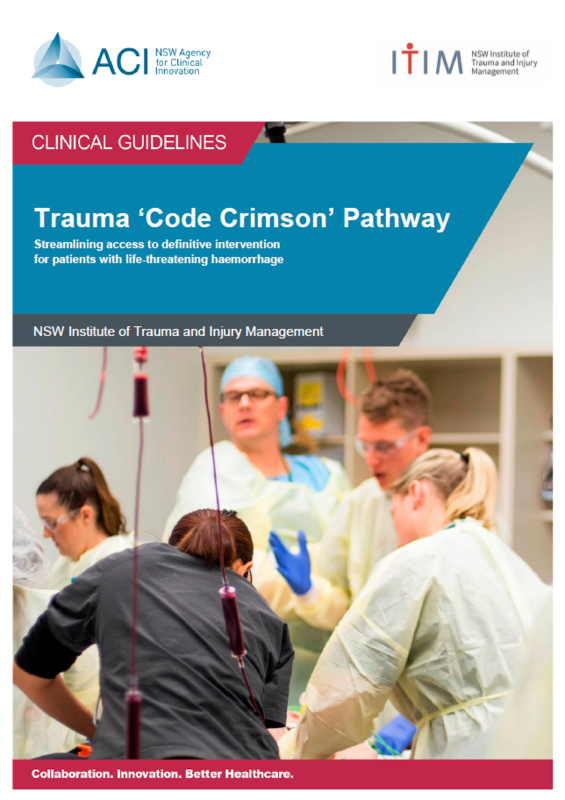 Trauma 'Code Crimson' Pathway - Streamlining access to definitive intervention for patients with life-threatening haemorrhage. Grabs, A., M. AN, et al. (2008). "Code Crimson: a life-saving measure to treat exsanguinating emergencies in trauma." ANZ J Surg 78(7): 523-525. Reed, M., A. Glover, et al. (2017). "Experience of implementing a National pre-hospital Code Red bleeding protocol in Scotland." Injury 48(1): 41-46. Tinkoff, G. and R. O'Connor (2002). "Validation of new trauma triage rules for trauma attending response to the emergency department." J Trauma 52(6): 1153-1158; discussion 1158-1159. Weaver, A., C. Hunter-Dunn, et al. (2016). "The effectiveness of Code Red transfusion request policy activated by pre-hospital physicians." Injury 47(1): 3-6. Your feedback on the Trauma Code Crimson pathway and associated implementation resources is appreciated.